If you are old enough or learned enough about music, you know the name Lena Horne. Kimmie is directly related to her and was fully inspired by the queen, wanting so badly to follow in her footsteps. Kimmie Horn is a wonderful vocalist, entertainer and business woman who manages her music career and created “The Kimmie Horne Caramel Corn” company which is distributed internationally. Kimmie, so music runs in your family. Tell us a little about the history. I am really proud of my families’ musical history. I am very fortunate to have been around music throughout my whole life. The Movie Star Lena Horne was a family member and frequently came to our family reunions. I wanted to be like her so badly. My uncle Cleveland Horne was a member of Motown’s very popular singing groups, “The Fantastic Four.” Their most popular song was “The Whole World is a Stage. He spoke to me constantly about getting into the music business and introduced me to many of the Motown greats. I’ve met Stevie Wonder, Diana Ross, Duke Fakir of the Four Tops and many more. The Legendary Jazz vocalist Betty Carter came out to many of my shows. She was very encouraging by telling me that I had a unique voice and I reminded her of herself when she first started singing. She was a good friend with my uncle Cleveland and loved my voice and was a big fan and motivator. I sang often with my uncle and I loved my family “get-togethers, as my father was a singer and played drums, my brother Tony Horne sings with my band and is very talented. I am producing a CD on him right now that should be out by August 2014. With all of that, I was hooked on different genre’s of music, Jazz, Pop and R&B… singing and performing, is what I was going to do for the rest of my life. What got you started singing and where did you start? Once again, my Uncle Cleveland was instrumental in me getting into the music business. As I stated, I come from a musical family. I also grew up in a city that was a huge part of the music industry around the world. One of my first experiences performing was going to Japan, for the first time with Anita Baker’s first band Quazar (formerly Chapter Eight) as the lead singer. I did background vocals for Grammy Winner, Earl Klugh’s CD, “Soda Fountain Shuffle.” I performed with two of Stevie Wonder’s band members and it just reinforced my interest and dedication to make music my career. I was invited into the recording studio by Motown’s Grammy Winner and “Hall of Fame” producer and songwriter, Henry “Hank” Crosby, who took me “under his wing” and taught me much about music and the music business. Have you had formal training? If so, what was that like? I had very little formal training… However, I took Jazz classes at Marygrove College in Detroit. I had the unique experience of training under Dr. Teddy Harris, a pianist and an arranger at Motown. Dr. “Beans” Bowles, of Motown, he was the Manager of the The Temptations, and was my mentor. He gave me private lessons for many years. Just as important, Jazz Legend Betty Carter and I had sessions where she was more encouraging that anything else. I was a regular performer at a supper club in Detroit, and she would tell me to “make the songs my own,” you have such a bright future in this business if you stick with it. As vocalists and artists, we strive all the time to get better and to improve. What were some of the things you did to help you accomplish that? I wanted to perform everywhere. I went, alone to many places, intense listening, sitting in, refining my sound. It’s a work in progress and something I’ve made a commitment to. I’ve always tried to challenge myself with different kinds of genres and even musicians. Whether it’s learning to sing in a foreign language or even doing some acting. You always have to continue to grow. Do you play any instruments? Why or why not? Well, I can play “some” piano and drums. I must confess, not as well as I’d like to, but I’m still a work in progress. As a woman who headlines her own shows, what are some of the obstacles that you face? Promoters can be challenging. Musicians can be challenging and Festival Organizers can be challenging. However, the more you prove yourself, the easier the relationships become. This is a relationship oriented business and I think that it can be difficult for a woman to build long lasting relationships. I’ve had the same discussions with many of the other females in this business. What is the day job like and how do you use it to improve or develop your artistic skills? Do the two relate at all? The two definitely relate to one another. From morning work outs, booking performance dates, rehearsals, recordings and constantly creating new marketing concepts, coupled with personal practice times and performing live. Selling and distributing my CD’s and distributing other products, such as Kimmie Horne Carmel Corn, The Worlds Jazziest Treat, it is a 24/7 endeavor. Tell us about your Caramel Corn venture. How did that come about and how are things going with it? The Kimmie Horne Caramel Corn sales are coming along quite well. I got distribution channels in many places. Japan of course and other locations such as Starbucks, area hotels and corporations. 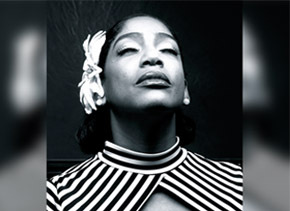 My website, www.KimmieHorne.com, at my shows, all throughout Japan and social media distribution, as: ITunes, etc. You’re regarded as being international. What kinds of things have you done overseas? I’ve been developing audiences all over the World. I represented the United States in the Legends of Jazz in Jamaica, with Sonny Rollins, Ahmad Jamal and Andy Hamilton. I’ve performed in Trinidad and Tobago, Puerto Rico and St. Lucia. I tour regularly in North America, which includes Amherstburgh, Windsor, London, Toronto and Montreal, Canada. I’ve been to parts of South America including Mexico. I’ve been to Europe and certainly, everywhere in the United States. I perform in Las Vegas on a regular basis and I am looking forward to doing Cruise Ships for the first time this year! But my mainstay overseas would be Japan. I go there every year and just celebrated my 20th year anniversary of traveling and performing in Tokyo, Osaka, Kobe, Nagoya and Kyoto. I have a developed a huge Japanese fan base. It sincerely has become, my home away from home. Detroit – the media tells us that the City is dead. Is it? What’s happening there for artist such as yourself? Detroit is far from dead musically. Some of the best artists in the business today either live or got their start in Detroit. Earl Klugh, The Winans, Kem, Anita Baker, Aretha Franklin, Eminem, and Kid Rock to name a few. I don’t have to tell you about all of the legendary Motown artists who still call Detroit home. On any given night, you can go to a major concert, a casino or a club and hear and see the next Anita Baker or Smokey Robinson. Music is in our DNA in Detroit. Detroit is far, far from being dead… after all, Detroit has Kimmie Horne. The question that we always like to ask is at age 60 or 55, what will you have done? Hopefully, I’ll still be able to perform and sing, and audiences will still want to hear me. Other than that, good health.